At Awards of Elegance we are the one-stop source for all of your recognition awards, including engraved plaques, engraved clocks, artistic glass awards and key-chains. We can also provide a wide range of high quality trophies, medals and personalized gifts. Whether you looking for an acrylic award, a crystal award , a metal award or a stone award, at Awards of Elegance you will surely find what you are looking for. . AWARDS There are 13 products. American walnut plaque with an antique bronze gavel casting. 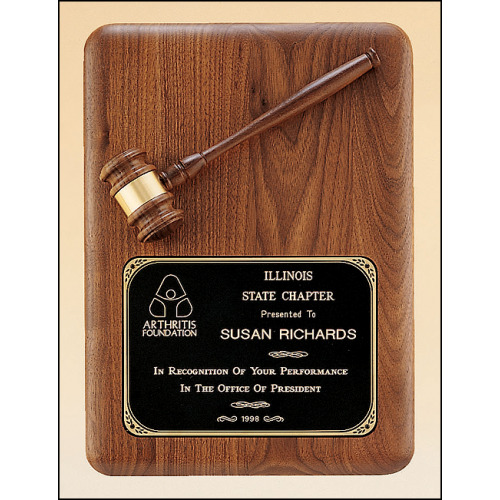 American walnut plaque with an antique bronze gavel casting.